Christopher Nolan serves up a wartime survival flick about Allied soldiers stranded on the beaches of Dunkirk, France, while the German army surrounds them. The water was so shallow, warships couldn’t pick up the troops, so loading the hundreds of thousands of soldiers was simply impossible. But the battle later became known as ‘The Miracle of Dunkirk,’ as hundreds of civilian boats came to the military’s rescue, carrying the waiting troops to their larger command carriers or straight to England. Nolan divides our attention between land, air, and sea. 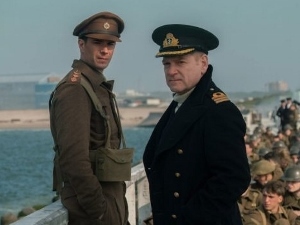 Tom Hardy plays one of three fighter pilots protecting the Allied Forces from above, while Oscar-winner Mark Rylance (Bridge of Spies) plays one of the civilians rushing his small boat to the rescue. Kenneth Branagh plays the British commander overseeing evacuation efforts on shore, and Cillian Murphy pops up as a traumatized soldier Rylance plucks out of the ocean. Despite some familiar faces, no one actor really carries the film. I’m not sure if there’s even a main character. It’s decidedly a plot-driven movie, but that doesn’t mean it isn’t an emotional one. If you have any sense of patriotism or love for your fellow humankind, Dunkirk should bring tears to your eyes. It’s a movie about action that hits the ground running and doesn’t let up until it’s over. There were a few times I was feeling the same sort of fatigue that Gravity gave me a few years ago, but at least I knew Dunkirk was leading up to something. Still, I wish it were a movie with more peaks and valleys — instead, it plateaus early and just slides gradually toward an ending. Don’t get me wrong — it’s a really good movie. But since it’s Christopher Nolan, and Nolan is capable of greatness (I believe), he gets graded a little harder than other filmmakers. I wanted to be excited, and the story seems to have everything necessary for creating excitement, tension, and relief… but it didn’t quite happen for me. For material so intrinsically emotional, Dunkirk felt oddly restrained. The one scene in particular that crystallizes this sentiment for me is when one of the characters is trapped in a sinking airplane. He’s trying to break the cockpit glass to escape, but he never once shouts or screams or gets emotional. He never once feels desperate to save himself. And in a way, that’s how everyone in the movie acts. I get that in states of shock, emotion may not register. I get that stoicism is it’s own form of bravery. But I wanted something more from the human beings in peril here. In addition, I’m not sure the cross-cutting between timelines really does the movie any favors, and I’m fairly confident I would have liked the movie more if Hans Zimmer’s score were more classical and less conceptual in nature. But again — if I sound hard on Dunkirk, it’s only because I respect and admire Christopher Nolan. He’s one of the best commercial filmmakers we have, and I go into his films with high hopes and expectations.